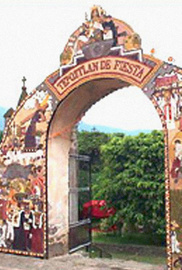 Every year, the market vendors of Tepoztlán create an amazing arch, made entirely of 85 different varieties of edible seeds, on the gateway to the parish church. Using the pictorial language of their Indian ancestors, each arch comments on the events of the year. These unique arches attract visitors from all over the world, and bring the people of Tepoztlán together as a community.